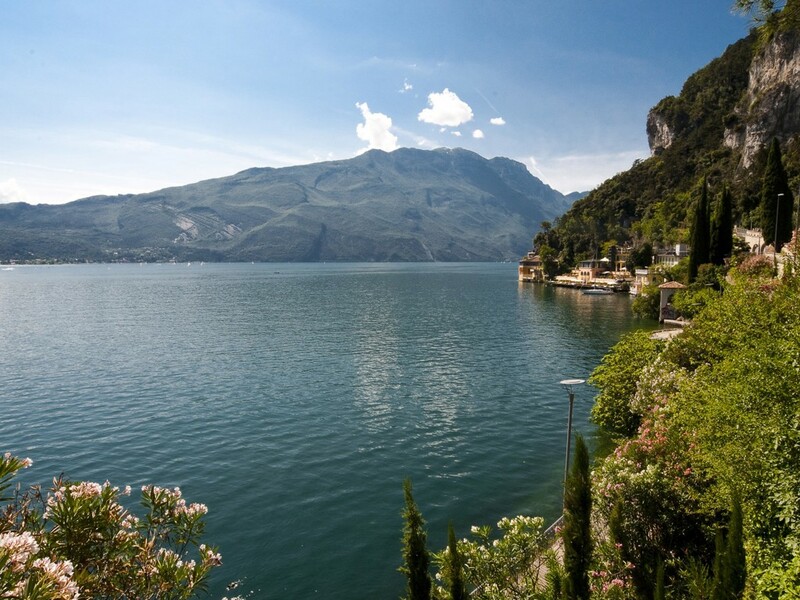 Holidays in Riva del Garda ↔ Discover Lake Garda! The pretty harbour town is a popular destination for bike tours and boat trips. A walk through Riva del Garda is always a pleasure thanks to a well-preserved, well-kept and traffic-free old town and a lively city centre with beautiful houses, promenades, elegant boutiques and inviting bars and restaurants. The city can look back on a long and eventful history. It was already known in ancient times, as there was a Roman navigation school and from the 11th century, all possible north Italian ruling families fought over the coveted harbour, which provided access to the Po Valley and therefore important trade connections. 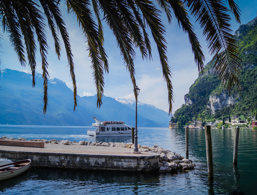 In the 19th century, Riva del Garda finally became a famous spa town, frequented by many famous travellers, including Franz Kafka, Thomas Mann, Friedrich Nietzsche and Rainer Maria Rilke. To date, Riva del Garda has become a beautiful tourist centre with an interesting cultural and sports program. The chic spa guest will be just as satisfied here as the sporty surfer or the extended family with different interests. You will always find a place to relax and unwind in one of the many peaceful spots such as the spacious swimming area with a wide pebble beach, the shady green areas, the waterfront promenades or the park. Riva del Garda is located at the northern shore of Lake Garda and offers perfect conditions for wonderful holidays. 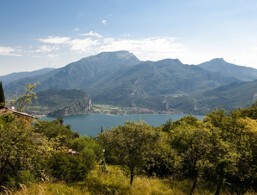 Discover the north of Lake Garda! The picturesque centre of Riva del Garda attracts many visitors. In the 12th century, the inhabitants of Riva were allowed to build a new fortress on the lakeside. After the complete restoration in 2002, it is possible to walk along the 165 steps that take you to the top of the tower. On the lakeside, there are many restaurants, bars and shops. The mild climate favours a typically Mediterranean vegetation with lemon trees, olive trees, laurels and palm trees. Riva is especially loved by its visitors, thanks to its marvellous green areas. 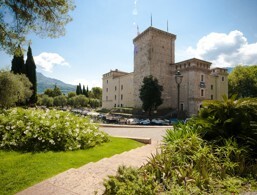 The seafront is ideal for an extended walk in the direction city centre and harbour along the castle of Riva. 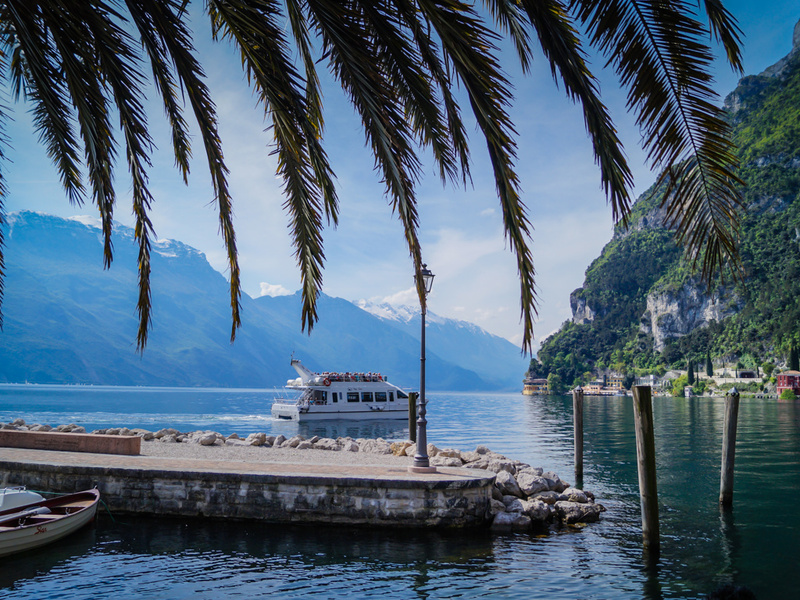 Riva's harbour serves as embarkation point for numerous motorboats and sailboats. 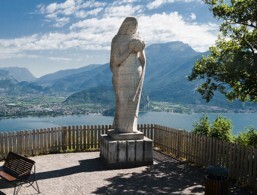 The statue "Regina Mundi" by Silvio Bottes at the old Ponale Road – today it is a cycleway – is located on a homonymous natural panoramic terrace. The beautiful square at the harbour is also the centre of the old town of Riva del Garda, surrounded by some stately old buildings, including the Palazzo Pretorio, the Palazzo del Provveditore and the Palazzo Municipale. At the eastern end of Piazza 3 Novembre stands a more than 30 m high, fortified town tower, whose foundations date back to the 14th century and is now considered the landmark of Riva del Garda. The old city wall is no longer protected however three mighty gates testify to the size of the former defences. The Castle on the waterfront goes back to the dynasty of Scaligeri, which ruled Riva del Garda in the 12th century. Over the years, the castle was modified again and again, until finally the city museum with exhibits of archaeology, painting and science were housed there. The octagonal sacred building in the old town is one of the main cultural attractions of Riva del Garda. The rather unassuming church was built in the 17th century by an unknown architect from Portugal. The Baroque interior is magnificent, and every corner is decorated with frescoes, paintings and stucco work. 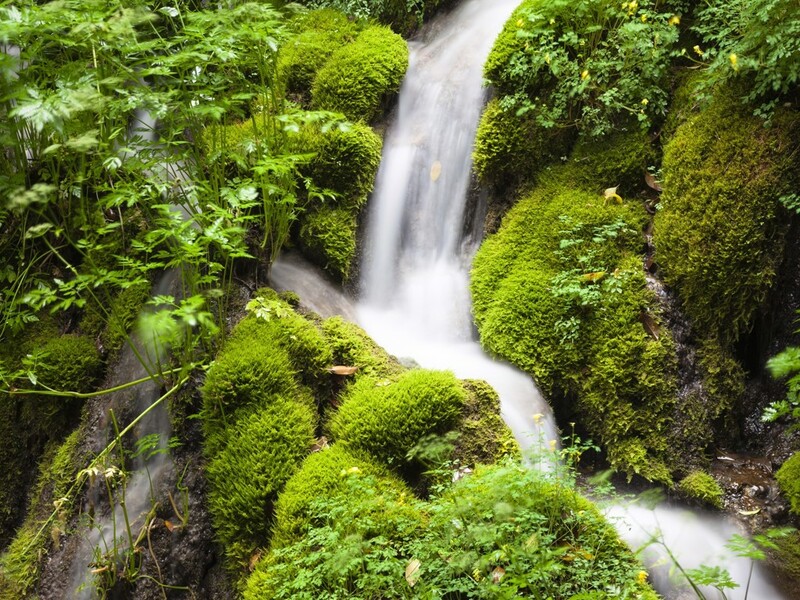 A detour to the surrounding area of ​​Riva del Garda should lead to Varone, where a roaring waterfall rushes down almost 100 meters. You can observe the glittering natural spectacle from two visitor platforms, which are accessible via paths and stairs. The accommodations at Riva del Garda were rated 4.2 out of 5 stars by 187 users.